How would you like this fabulous kit by some of the gals who tried out for Design Star and didn’t make it all the way to the end? All you need to do is go hop on their blog train and it’s yours!!! The train starts at Carol’s blog here. They jokingly call themselves the Design Star Cast Offs and I think it says a lot about how much talent there was in our DS contest when this caliber of work didn’t move on. Enjoy and leave them lots of love, they sure deserve it. Get Ready to Have Lots of Fun! National Scrapbook Day Celebration Starts on Friday! 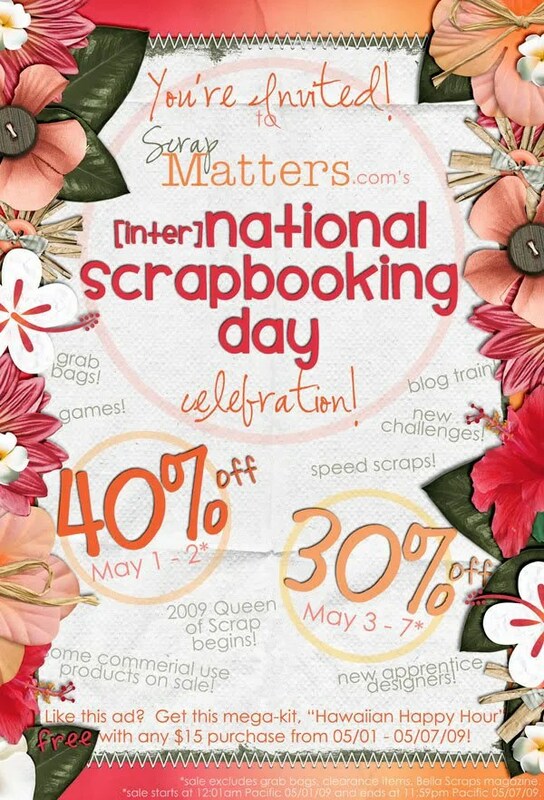 ScrapMatters has so many terrific things planned for [inter]National Scrapbook Day (NSD) that I don’t know where to start. We are having a blog train featuring quick pages made by our CT/DT using Hawaiian Happy Hour as well. It will start on Saturday, May 2nd at 7am Pacific time on my blog: https://andilynn.wordpress.com. You might find some other little goodies as you hop on and off the blog train as well. ;D We are having lots of speed scraps, challenges and games throughout the week as well. We had so much fun last year during NSD that I can hardly wait for the good times ahead starting this weekend. We are announcing the winners of the Design Star Contest on Friday, May 1st. We are so excited with the talented new batch of apprentices that we have. It was such a great contest with so many good applications that it was really hard to choose who to take onto our team. May 1st is also the start of the Queen of Scrap Competition (QO). For those of you who don’t know about it, here’s a brief overview: the person who scraps the most NEW layouts between May 1st and May 31st will win a $50 gift code to the shop. The top ten posters will be eligible to be judged and we will pick a Queen and two Princesses from them. The Queen is awarded a three-month stint on the SM CT and the Princesses will each receive one month stints on the SM CT. Throughout the contest there will be chances for everyone to win free template sets, free kits and more. 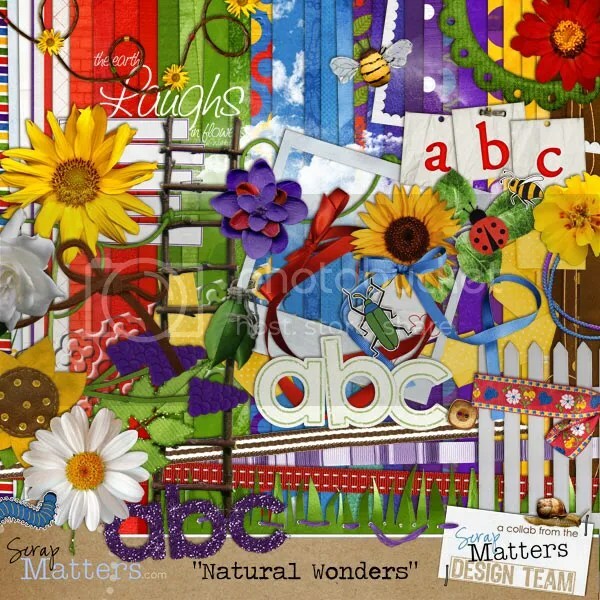 Natural Wonders, the mega kit pictured below, is FREE to all contestants who post at least 20 layouts to their QOS gallery between May 1st and May 31st. Denise Beatty, our reigning Queen of Scrap, and Happy Scrap Girl are in charge of this year’s QOS competition and I know that they have lots more fun things planned. The best part of NSD and QOS is getting to know and spend time with you! Hopefully you will take time to drop by, make some new friends and enjoy the fun. Spring is finally starting to show it’s colors here in the beautiful Pacific Northwest where I live. I am so happy to share with you our April newsletter. 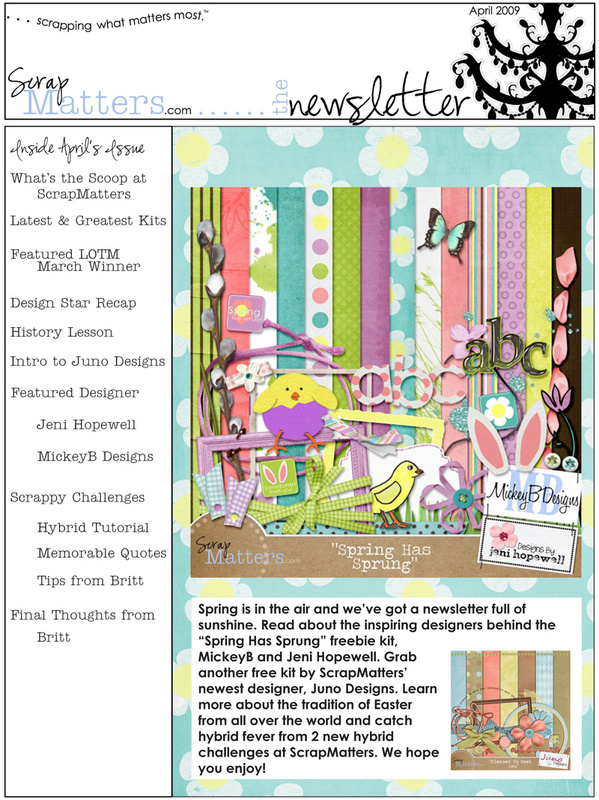 It is filled with some fabulous inspiration and a terrific freebie kit by Jeni Hopewell and Mickey B Designs called “Spring Has Sprung.” You absolutely don’t want to miss it. To download the newsletter from 4shared click here. To download from box.net click here. To download frommediafire click here. And don’t forget to pick up the coordinating freebie in the shop–hurry it won’t be free for long and then into the shop it goes. I’ll be adding this freebie to 4shared and box in a little bit, but for right now you can grab it in the shop. Also my CT did some gorgeous layouts with it that I will be back to share. I’ve got shingles and am just really wiped out. I need a little nap and some pain medicine! Jessica, one of my real-life friends and a fantastic photographer, is sponsoring a comment contest on her blog. She is giving away a free photography mini-session for Mother’s Day to people that live in the Seattle/Bellevue area. She made this little story board for me to put on my blog to showcase her work. Another one of my friends is the beautiful pregnant woman in the story board below. I just love that photo of her. Jessica does a fantastic job finding catch lights in the eyes of her subjects, as you can see when you look at these darling little boys. As part of her promotion I am also giving away a $10 gift certificate to Andilynn Designs (I promise there will be new stuff in the shop soon). Also as a part of this contest some other IRL friends Allison & Teri are giving away darling handmade sensory quilts from their company Touchy Feely Quilts. How cute is this little quilt? Perfect to keep a child happy and quiet at church, on trips etc. I really hope you’ll take the time to go visit Jess’ blog and her site. She especially loves to take senior portraits so if you know someone who is going to be a senior next year send them her way. Hello—I can’t believe how easy it is to hit the wrong button in phpList–I thought I was pushing test and hit send. I might go back to our old newsletter mailer, at least you could stop it when there was a mistake. I think the newsletter is going out now, but you might get a blank one first or not. Since I really can’t tell what’s going on with the mailing I thought I would post this month’s newsletter here. So keep reading and you’ll find all of the important links! It’s hard to believe that March is here already. I’m happy to present the March issue of the SM newsletter. Included as usual in our newsletter is a fabulous free kit. This month features a fabulous travel-themed kit called “Enjoy the Journey” by Heather (Dirty Feet Designs) and Wendy (wm2 designs). Our Design Star Contest is moving along just great. It was so hard to narrow down the contestants. We received 90 fabulous mini-kits and tried to pick 20 favorites–we just couldn’t do it, so there are 25 contestants moving on to round two. The round one mini-kits are almost finished as freebies and the round two paper packs are going up tomorrow morning. So hurry to get these fabulous freebies while they are still available in one convenient place. If you’re looking for the design star freebies log into our forum and hop on over to the gallery from there and check out all of the free mini-kits/paper packs in the Design Star category (you have to scroll down to almost the bottom of the gallery to find them). You must be registered and logged into the forum/gallery to see the entries. We’re giving you several options from which to download your newsletter. They all have the exact same newsletter. Here is the mediafire link to the March newsletter. Wow!! I am so impressed by all of the fabulous mini-kits that we received in our first ever DESIGN STAR contest. Talk about talent! 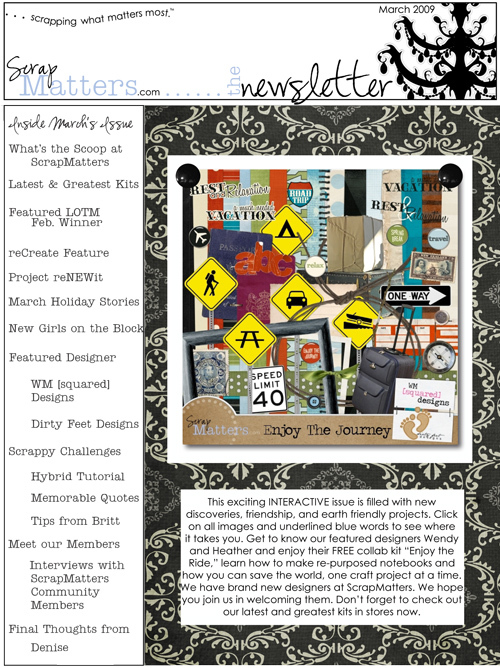 There are 90 of them and I can’t share my favorites, but just know that there are some terrific mini-kits for free waiting for you to snag via box.net at ScrapMatters. You MUST be registered and logged into the forum, to hop over to the gallery to preview these and grab your favorites. If you’re new to ScrapMatters the word you need at registration is digital. Make sure you leave some love, these gals have worked soooo hard to create these beauties. I really want to show you some of the entries–ok to be fair I’ll just pick some random numbers at random.org and share those kits with you. I’ve just shared with you 5 random entries of the 90, I’ll try to come back and share some more later. They are only available for a short time, so go grab them while you can.